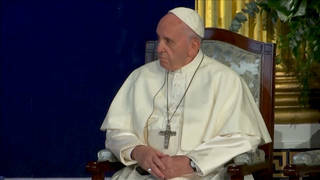 Pope Francis in the USA: Calling for Revolution of Tenderness, Pope Touches Down in Richest Nation | Democracy Now! JUAN GONZÁLEZ: Pope Francis has kicked off his historic U.S. tour. During his six-day trip, Francis is expected to share his message of compassion and simplicity with the world’s richest and most powerful country. On Tuesday, both President Obama and Vice President Joe Biden honored the 78-year-old pope by personally greeting him on the tarmac after his plane landed at Joint Base Andrews near the capital. This is the first time the Argentina native has ever stepped foot on U.S. soil. Hordes of devotees have flocked to Washington, D.C., in hopes of catching a glimpse of the pontiff during his stay. AMY GOODMAN: Today, the leader of the world’s 1.2 billion Roman Catholics will hold a formal meeting with President Obama for about 45 minutes alone in the Oval Office. On Thursday, Pope Francis will make history, becoming the first pope to address a joint session of Congress. And on Friday, he’ll address the United Nations General Assembly here in New York City before departing for Philadelphia on Saturday to deliver an open-air mass where one-and-a-half million people are expected to attend. The pope’s visit to the U.S. comes after a trip to Cuba, which he wrapped up by calling for, quote, “a revolution of tenderness.” The pope had been crucial in brokering the diplomatic thaw between Washington and Havana. On Tuesday, he told reporters he hopes the United States will lift its five-decade-old trade embargo on the island. POPE FRANCIS: [translated] The problem of the embargo is part of the negotiations. This is a public thing. Both presidents have referred to this, so it is a public thing that is moving along the path of the good relations they are looking for. My desire is that they end up with a good result, that they reach an accord that satisfies both sides—an accord, certainly. With respect to the position of the Holy See, with respect to the embargoes, popes before me have talked about this, not just this one, but in other cases of embargo. There is a social doctrine of the church with regard to this, not just this one, which is so precise. The pope has also come under criticism for his decision to canonize Reverend Junípero Serra, a Spanish-born Franciscan friar known for starting nine Spanish missions in California in the 1700s. Native American groups are protesting the pope’s choice, saying Father Serra was part of the Spanish conquest and genocide of indigenous populations. AMY GOODMAN: Well, for more, we’re joined by three guests. Julie Byrne is with us, author of the forthcoming book, The Other Catholics. She is an associate professor of religion and the Hartman chair of Catholic studies at Hofstra University. Valentin Lopez is also with us, chair of the Amah Mutsun Tribal Band. He’s leading efforts to oppose Pope Francis’s decision to canonize Father Serra. He has written a letter to the pope expressing his concerns. And in Washington, D.C., we’re joined by Esmeralda Domínguez, a domestic worker who’s part of a group of 100 women, many of them undocumented, who have just arrived in D.C. after marching 100 miles from a detention center to the capital in order to greet the pope. Domínguez is recovering from bone cancer, and her primary caretaker is her husband, Jesús, who is undocumented. The march was organized by We Belong Together, which is a national campaign co-founded by the National Domestic Workers Alliance and the National Asian Pacific American Women’s Forum. JULIE BYRNE: Well, the pope visiting the United States is always a huge thing. Other popes have visited. That this pope is addressing a joint session of Congress means that he is willing to take on all the superstar power that is available to him that he has definitely cultivated. “The other Catholics” are Catholics who are not affiliated with the Roman church. A lot of people imagine that there are no Catholics not affiliated with Rome; if you’re Catholic, you are definitely under the pope. But there are a small number of Catholics who have decided, you know, the pope is not crucial to Catholicism, and stand apart from him. So those are who I write about. Right now, I’m concerned, however, with how this pope is addressing, you know, a quarter of the U.S. population who is Roman Catholic and manages to attract so many who are not Catholic to his messages. JUAN GONZÁLEZ: And in terms of the pope’s stance so far on issues relating to Catholic women and ordination and abortion, what are your concerns there, even though he’s received much praise for his progressive social stances? JULIE BYRNE: He’s doing amazing things regards the women of the world, insofar as his concerns for the Earth, for immigration, for poverty, for runaway capitalism really does lift so many women all over the world who are impoverished and in dire circumstances. However, he could do more, and he is afraid of women in power in the church, namely, being ordained to the ranks of clerical classes—deacon, priest, bishop. Other Catholics do ordain women already. The Roman Catholic Church, including this pope, who is perceived as so progressive, is not willing to budge on that. AMY GOODMAN: What about his position overall on reproductive rights? JULIE BYRNE: His position overall is consistent with the Roman Catholic Church on reproductive rights, and that means no artificial birth control and certainly a pro-life stance that’s against legalization of abortion. And the U.S. bishops have been for decades holding that line and made it an overweening concern of theirs. The pope did, in his Year of Mercy letter, extend a indulgence to the women who might want to confess to abortions, welcoming them mercifully back into the fold through the sacrament of confession to priests, rather than making them go through a longer process to bishops. This is a mercy, if you do believe that abortion is a sin, should not be legal and is one of the gravest sins, in fact.